...........Despatch considers it "Countdown" not "Countup". "Building a Better World Together, 1 Day at a Time..."
as an opportunity to work together to build a better future. Count-UP to the Year 2000.
took place all around the world. Make Each Day Count Think, Pray or Meditate for Peace On Earth at 12 Noon EVERY DAY Perform at least 1 act of kindness Each Day Keep a Peace On Earth Journal - 1 page for each thing you'd like to change in yourself and in the world. Each day find 1 positive victory to record for yourself and for our world Join people across the globe by asking your Mayor or Governor to declare a Proclamation of Peace for January 1, 2000 and the Year 2000 as The Year For Peace On Earth Start a CountUP 2000 Circle or World Peace Club in your school, job or community - help inspire & encourage each other Spread the word about our wish for a Positive future that we will create together, 1 day at a time. There are 29 Robert Muller Schools, and Dr. Muller is called, "the father of Global Education" with his world core curriculum. Robert believes that his approach to education works as a model for global education in an interdependent world. In his acceptance speech for the UNESCO Peace Prize, Muller urged governments to take peace education seriously, for the adoption of the World Core Curriculum, and for increased support of international schools. each and every day, one day at a time. On September 13, 1996 the first Global Conference of the WORLD PEACE 2000 Network met at the United Nations to discuss the possibility of making peace on earth a reality in the 21st century. Representatives from nearly 30 different countries attended this inspiring day of unity, inspiration and hope. This worldwide network of individuals, groups and organizations is dedicated to helping promote a resolution before the United Nations to declare a 24-hour world cease-fire on January 1, 2000; a Declaration of Peace culminating on January 1, 2000 as WORLD PEACE DAY; and the year 2000 as The INTERNATIONAL YEAR OF PEACE. The DinoPals Love The Earth ........................... Kidz Care! "WORLD PEACE: The Children's Dream!" inspired by the picture book, ONE DAY IN PEACE, January 1, 2000. If there is righteousness in the heart, there will be beauty in the character; If there is beauty in the character, there will be harmony in the family home. If there is harmony in the home, there will be order in the nation. When there is order in the nation, there will be Peace in the World. 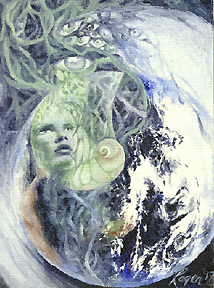 The lovely World Peace Angel, pictured above, was painted by Joanne Macko. Prints of the WORLD PEACE ANGEL, can be found all around the world - including at the United Nations and at The University For Peace in Costa Rica.